Hey everyone! Finally, the weather is changing and its starting to get warm here. You know what that means.....water bottles, tumblers, and lemonade pitcher! I want to start by showing you this mason jar pitcher with a spigot that I added some 651 adhesive vinyl to. My son and his girlfriend's kitchen is lemon themed, so I thought this would be a perfect addition! I purchased the images for the pitcher from the Silhouette Design Store. Next up are some water bottles for smaller kids. The designs for these bottles were purchased from Cricut Design Space. Once again, I used 651 adhesive vinyl for the designs. The last couple of tumblers were made for friends. One is an elephant lover, and the other is in a Sorority in college. Do you get tired of the pesky door-to-door solicitors! I'm not about where you live, but where I live, we get people selling anything from newspapers, to new roofs, to house renovations, and more recently some saying they can lower our electric bill! Well, a friend of mine who as a toddler, as well as a couple of dogs, is disgusted with these solicitors tool She asked me to make a sign for her to display on her front porch to help discourage these solicitors. With my friend, a door knock or door bell ring, started a chain reaction! The dogs would start barking, which woke up the baby an made him cry, then you have a very unhappy mother!! This is the sign we came up with! To my knowledge she hasn't had any further trouble with solicitors at her home. This was a quick and easy sign to make. I took a piece of 10 x 16 piece of wood, sanded it down so that it was really smooth. Added a coupe of light coats of Golden Oak Stain and let dry. While the board was drying I used my Silhouette Cameo and a piece of 651 Outdoor Adhesive vinyl to cut out the lettering. I then applied the lettering to the sign and added a piece of deerskin leather to the top so that it can be hung! And it's a quick way to make a sign when you have limited time!! I thought I was totally prepared with handmade HTV onesies for my soon-to-be arriving grandbaby. Well, I wasn't. Two days ago, I was blessed with my first grandchild.....a grandson. He was a big little guy. He weighed in at 9 lbs. 14 oz. The onesies I had prepared in advance were size Newborn. He was too big to fit into them lol. So what does a new grandmom do? She stays up all hours of the night to re-make the onesies in 0-3 months, a size which will fit him for a short time. On top of that, my other son and his girlfriend also wanted to give the baby a handmade onesie, so I added that to my list of things to do immediately! When I saw his little face, I knew some of the onesies I had made, didn't fit his little personality. So these are the ones I made for my precious grandson. Here are the ones that I made for my son and his girlfriend to give their new nephew. My niece was visiting a couple of weeks ago and she wanted to make some t-shirts for her and her husband. Off to my craft room we go! She wanted some summer/beach/boating themed shirts for them. After looking in the Silhouette Design store and getting a few images, we also created some of our own images. They boat a lot, so, of course, Boat Hair Don't Care was on the list. Also on the list was a Beach Life Shirt, a couple of fishing shirts, and a shirt with their boat name on it. We cut all the images out on my Silhouette Cameo, and heat pressed them on the shirts with my heat press. My niece had soo much fun, she ordered a Silhouette Cameo and Heat Press for herself. She is now enjoying the craft of HTV!! I finally purchased my first Dylusions Journal! I was soo excited to get it I just had to do a page right away. My favorite season is Summer and the Beach, so going with that theme, I started my page. For the background, I used Tim Holtz's Distress Oxide Ink in Faded Jeans and Broken China. I made a wave stencil and cut it out with my Silhouette Cameo. I got out my Faber Castell Whipped Spackle and some blue acrylic paint. I blended the two together to use with the stencil. I placed the stencil over the page and applied the colored Whipped Spackle. I knew I needed sand, so I went across the street to the beach and picked up a small jar of sand. 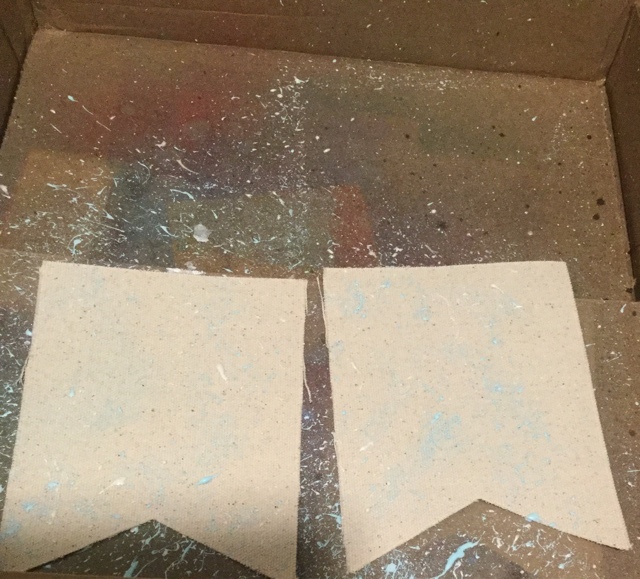 I mixed the sand with some Mod Podge just until all the sand was covered. Using a spackle knife, I applied the sand to my journal page and pressed hard to make sure it stuck. Then it was time to wait for the blue background and sand to dry. While that was drying, I stamped my Julie Nutting doll on a piece of Julie's A4 Buff paper. That is a great paper pad because it gives you several different skin tones. For the clothes, I paper pieced them and glued them on. The hair and hair band were colored using my Spectrum Noir markers. Once everything was dry, I glued my girl so that her knees were in the sand. I then added a couple of brass shell embellishments on the sand, and a sailboat in the distance. The sentiment says it all! "Simple Times".....they are the times I cherish while at the beach where you can forget everything and totally relax while listening to the sea. Hi there! This year I wanted to make my mother-in-law a different type of Mother's Day card. The first place I went was the Silhouette Design Store. They have soo many types and shapes of cards, it's really hard to choose. When I came across this sewing machine, I knew that was the perfect one! My mother-in-law has been a long time seamstress and I just knew she would love this. I cut the card out with my Silhouette Cameo using different patterned papers from my stash. For the needle and handle, I heat embossed them silver using embossing power by Brutus Monroe. I then added just a few enamel dots and a flower and it was done! This was definitely a quick and easy card to make!! I know this post is a little late, but better late than never, as my Mom always told me! A friend of mine needed an Easter basket for her daughter. She couldn't find a lined basket that she liked. So, she bought a nice white basket and some really pretty fabric to make a liner. Along with the basket and fabric, she also dropped off a onesie to be deisnged for Easter. I had never made a basket lining before, so the first place I went was Google. I don't know how I ever lived without Google! You can find everything there! 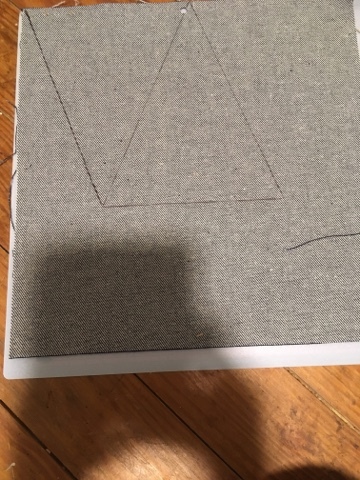 I found directions on how to make a basket lining for a round basket, took the measurements I needed and cut the fabric. The first part was to sew the bottom circle to the side fabric. 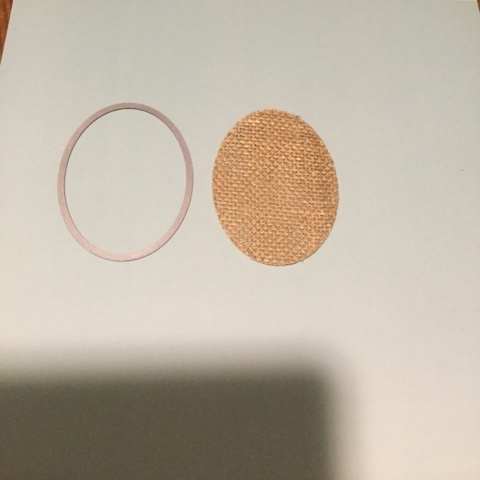 The side fabric had to be gathered some to fit the circle. The next to sew together was the flap. I measured twice and cut once for the front flap and back flap pieces. The next to sew together was the flap. I measured twice and cut once for the front flap and back flap pieces. I pinned the flap pieces onto the lining just to be sure they were the right length. Next on the agenda was personalization. I put one of the flap pieces in my embroidery machine and added her name. Then sewed the flap pieces to the basket lining and added some ribbon at the end of each flap so that it could be tied on the basket. On to the onesie. My friend had picked out a super cute Easter image for the onesie. I purchased this image from Apex Embroidery and cut it out of Heat Transfer Vinyl. Using my heat press, I pressed it onto the onesie. My friend was extremely happy with both the basket and the onesie!! That sure makes a girl feel good! 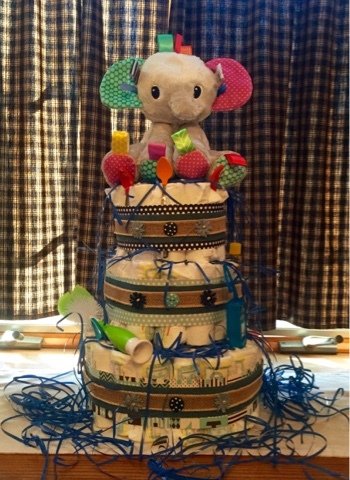 I was asked by a friend to make a hunting themed diaper cake for her daughter's baby shower. The only ideas she could give me was camouflage and orange. So, I put my thinking cap on and headed over to the Silhouette Design Store. In the Store, I found a 3D deer head which I thought would be perfect for the cake topper! I proceeded to cut all the pieces out for the deer head. I cut out two sets of antlers so that I could add some thin wire between them to be able to bend, if needed. I then glued the antlers, and green "plaque", and slid the head pieces on the head. Then it was time to work on the cake. I rolled and rubber banded 76 size 2 diapers. I use size 2 in case the mom-to-be wants to use the cake as a decoration for a while. I could not find any camoflage ribbon, so I purchased 1/2 yard camo fabric and 1/4 yard orange fabric. I cut the camo fabric at 3" and the orange fabric at 1.5" to use as my ribbon. I also made some bows out of the fabric to place on the backwhere the ribbon meets. It was time to get images to place around the cake. So, back to the Silhouette Store I went. I cut several images that have to do with hunting. I wanted a special image for the center front. I found an antler monogram image, cut that out, and added the baby's initials. Before placing the images onto the cake, I inked the edges with Vintage Photo Distress Ink. For the front, I knew I wanted to add his initials. I found an antler monogram file in the Silhouette Store. I added his initials and placed them inside. I then placed the antler monogram center front of cake. I also added a couple small images on the bottom and top layer of the cake on the front. The last thing to do at this point was add the 3D deer head to the top. I cut two pieces of fairly heavy chipboard the same shape as the plaque. I then glued the deer head plaque to one piece of chipboard. I added two pieces of metal rod to the remaining piece of chipboard about 1" from either side so that the top wouldn't spin. Now its time to glue the two pieces of chipboard together. I spread wet glue all over it then added some hot glue to the top edge. Put both pieces together fast so the hot glue doesn't dry. Press hard, then add hot glue down the sides and on the bottom as needed so the pieces stay glued together. I didn't like the raw edges of the "plaque" section, so I cut a thin strip of orange fabric and glued it around the edges with fabric glue. The final addition, was a bow on the back of the plaque. And here is a picture of it surrounded by all the presents at the baby shower. 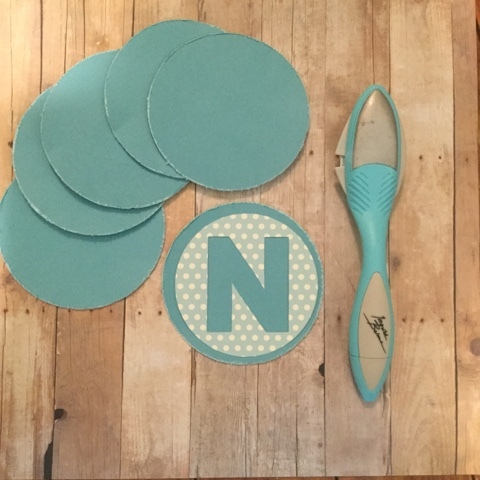 It was a huge hit at the shower! The first thing I did was choose the fabrics I wanted to work with, and cut them into the shapes I needed. 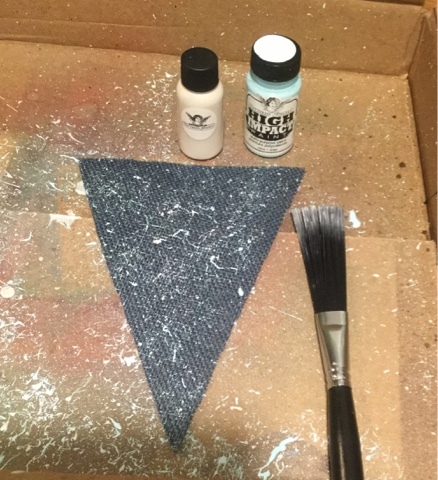 I then splattered baby blue High Impact Paint and metallic white High Impact paint on all my pennant pieces. When they were dry, I added a light spray of navy blue and old lace Glimmer Mist. 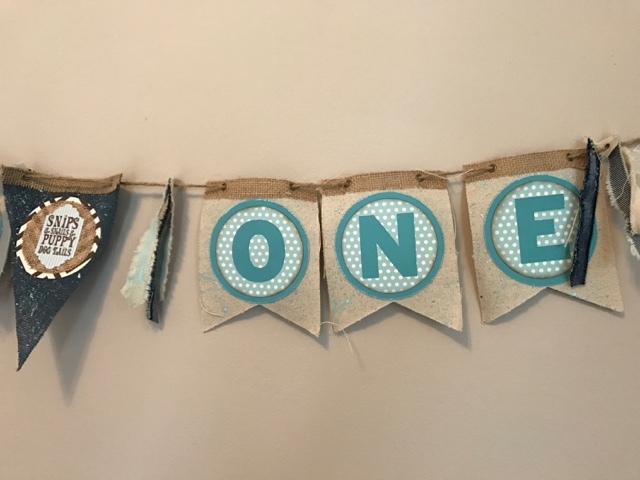 The lettering was cut on my Silhouette Cameo using paper from the Snips and Snails collection. I distressed the edges of the circle with my distresser. 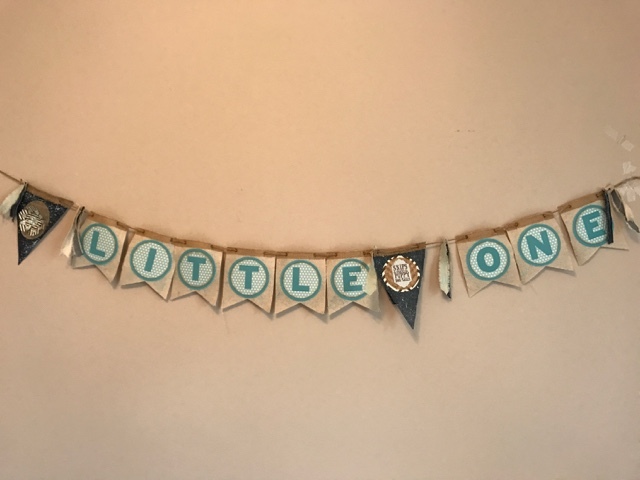 I layered the cut out letter on a solid circle so that the baby blue stood out. 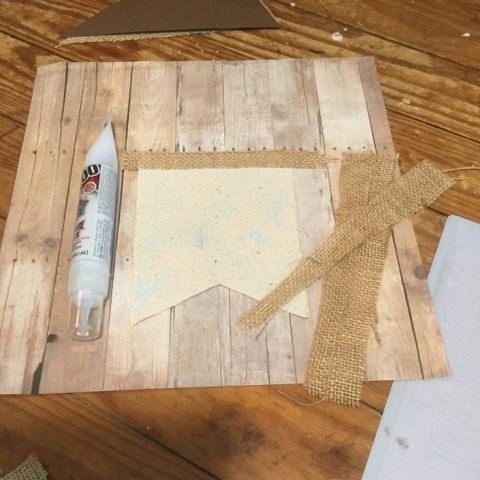 I then added some burlap ribbon at the top. For the end pieces, I cut two ovals out of burlap. 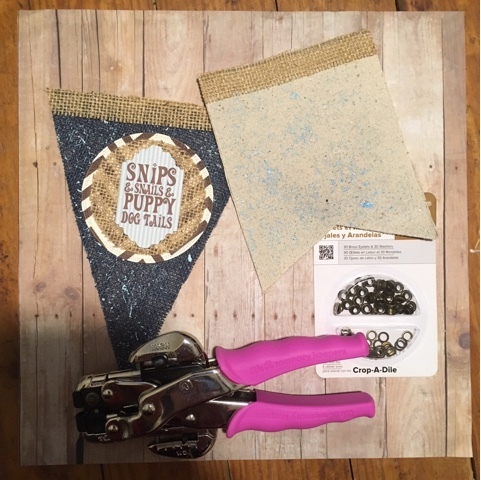 I used my Big Shot and Tim Holtz’s Tattered Flower template to cut flowers or each end. 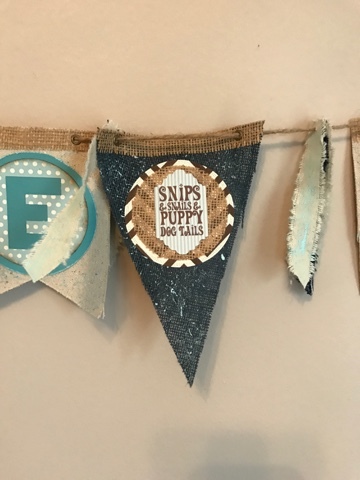 For the blue burlap pennant between the words, I used a burlap circle layered on a piece of paper from the collection, and a tag from the new Baby Tag set. 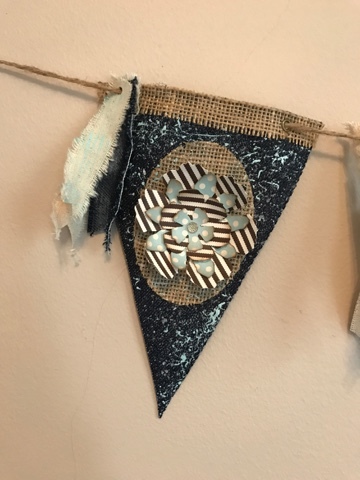 Between the first pennant, and between the words, I tore some denim and canvas to make a fringy look. I then added some navy glimmer mist, baby blue and white metallic high impact paint. For the penants at each end, I used my Big Shot and cut Tim Holtz Tattered Flowers and adhered them on the burlap ovals. 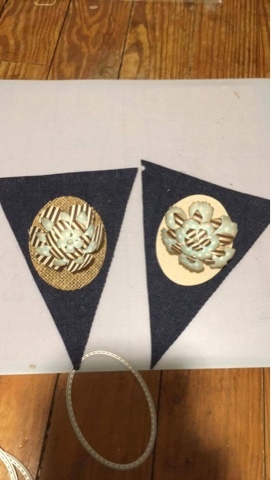 I then cut some burlap ribbon and adhered to to the top of each pennant piece. For the finishing touch, I used the Crop-a-Dile and attached bronze eyelets so I could thread the twine through all pieces. 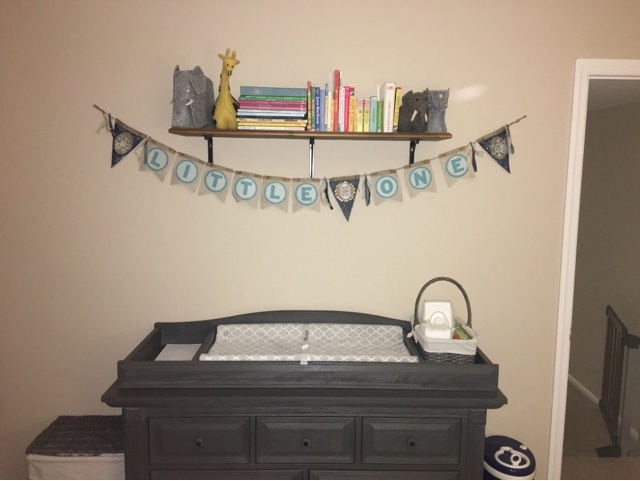 It looks great on the wall above the changing table. All the colors used are just perfect!